The leaves have fallen and it feels a lot more like winter than it does autumn. I decided this weekend (in a break in the rain) to prune my orchard I planted earlier this year. Although there's 23 trees in there so far it didn't take long as all the trees are so young. I basically looked at each tree for disease or damage first. Unfortunately I found some woolly aphid damage on a Victoria plum tree that I had transplanted over from my old allotment. This can easily be mistaken for canker but I could see the little buggers in there! I decided to cut away the affected wood as the tree is still young and I can train a new branch to replace it rather than having it grow weak. I also know that you're not really meant to prune stone fruit this time of year as it can encourage sliver leaf but as it was damage I decided to do it anyway. Once I removed that I then looked at the trees for shape and removed any branches that I thought were too low (I'm not talking many here as they haven't got many to take!) and then looked at the top of the tree and made sure they didn't have too many heading straight up, reducing or removing them if there was too many - this was only really in some of the two year old trees I bought. I'm aiming to have "polo" trees eventually - trees with a hole in the middle or goblet trees as people like to cal them. 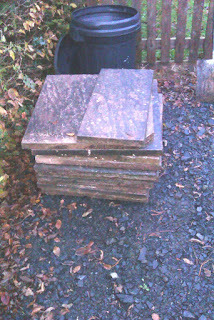 Out of 23 trees I didn't even have a handful of twigs at the end but at least I'm starting how I mean to go on. Those fruit tree pruning course I did at Pershore college a few years ago were worth every penny. Next weekend I'm going to tackle a mixed orchard I planted at my parents farm around 8 years ago, it's just starting to be really fruitful (if you'll excuse the pun) and I've been pruning the trees every year to produce the maximum amount of fruit. Anyone else got plans with fruit this winter - I'm really looking forward to my 22 different sorts of apple trees being delivered. Well not so Glorious really. 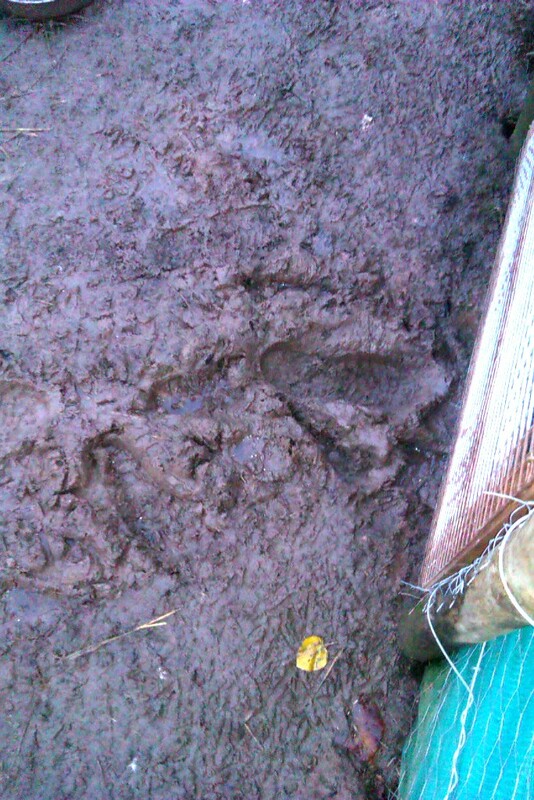 The mud around my chicken pens and garden is becoming a real pain in the bum. 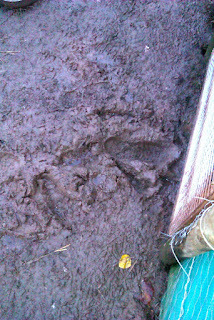 I hate having to walk through it twice a day to feed the birds and leave my muddy boots in our tiny litttle hallway. I've put down wood chip but it soon becomes part of the mud, and I've put down straw but that does much the same, what to do? I have come up with one solution, but t'ts going to involve a bit of effort (mind you all good things do!). 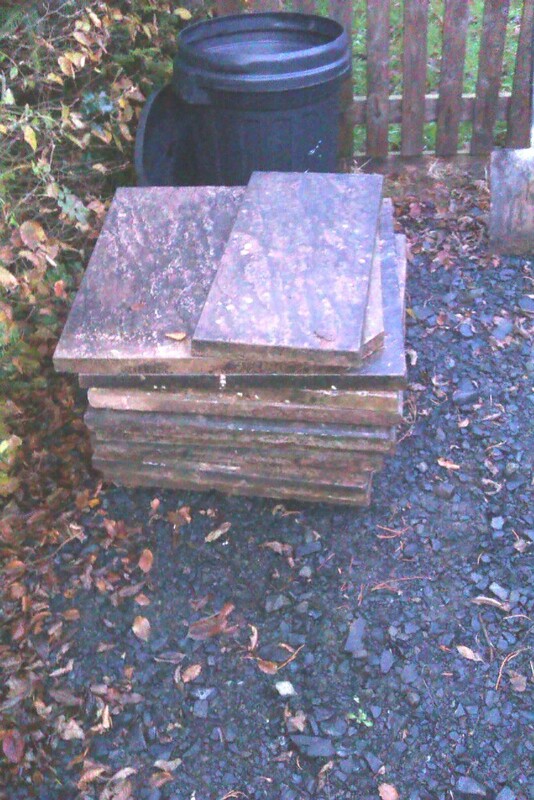 It involves around a hundred 2ft x 2ft slabs I've been given (bargain). I've got to pick them up and bring them home first and they need a good wash off as they're quite black at the moment, but they should cover a large area. I'm thinking of a path down the veg garden and fruit garden and some paths to the chicken pen and feed shed. I'll probably just lay them on soil for now as I'm not sure where everything is going to stay at the moment, but it should go a long way to reducing the amount of mud around the place. I should even have some left over to maybe make a patio for the spring when my little girl should be out and about. The slbas are quite a large long term project - Anyone else got any ideas for reducing mud in this wet year that is a bit quicker? The nights are really drawing in now and things are starting to get a little cold. You can already tell the difference having insulation in the loft and walls is making to our little house though. I don't mind the cold too much though - not like my wife anyway! I guess it's because I work outside everyday and I grew up working and playing outdoors more than most. When I lived at my parents farm they didn't even have central heating or double glazing (they installed both shortly after I left). The curtains in my room would blow with the wind and freeze up on the inside. I'd just put another jumper on though, knowing how to dress is half the battle. 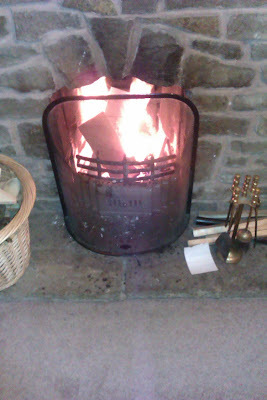 Our open fire - We now have a second fire guard around it as well to prevent a crawling baby! Heating our house at the moment we're trying not to use the oil central heating too much, although with a young baby our house is definitely kept warmer than it used to be when it was just the two of us. I'm trying to use the open fire as much as possible, being a carpenter I'm never short of wood to start the fire with and my tree surgeon of a brother keeps me stocked with logs. But the open fire doesn't give off much heat, most of it goes up the chimney, but it does warm the living room and makes it feel cosy. I'd like to fit a log burner at some point but I think I'd have to completely remodel the living room to fit one in and extending the house should really be our first job. Having an open fire made me realise how out of practise I was at lighting fires, I've been on quite a few survival courses ad grew up being a borderline pyromaniac, I've started fire with friction using a bow, used fire steels and a battery with iron wool but I forgot the most important skill with something like this - practise! Now I up on my practise and limit myself to starting the fire with one match and I might even remove that luxury soon! Mind you I'm much better than my wife - I've brought her some fire lighters so she at leasts stands a chance of getting a fire going! How do you light your fires?